PicoSure by Cynosure is the most advanced laser technology for fast, safe, and effective removal of tattoos of all colors. 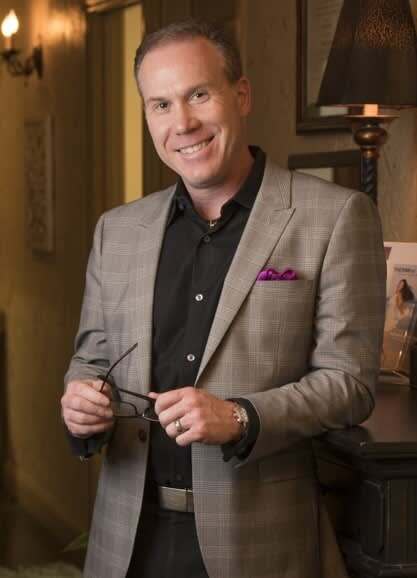 At Mansfield Cosmetic Surgery Center, we use the FDA-cleared PicoSure device for clients living near Mansfield, Arlington, Grand Prairie, Waxahachie, Fort Worth, and PicoSure Tattoo Removal living near Dallas. 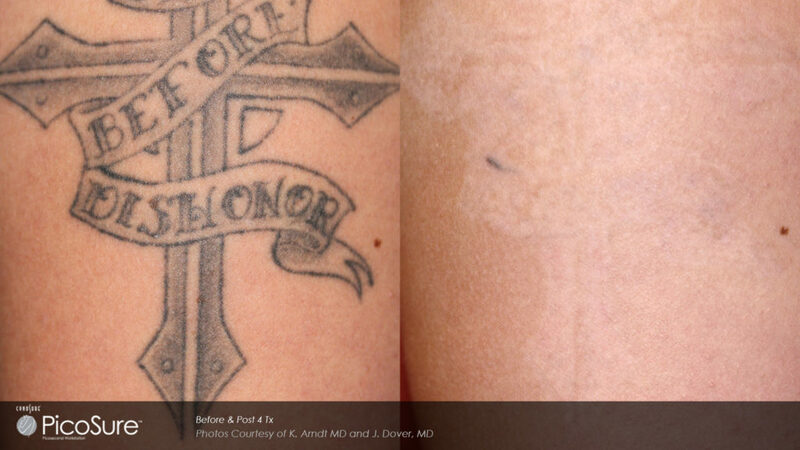 Today, it is faster, easier, and more popular than ever to have tattoo removal. At Mansfield Cosmetic Surgery Center we are the only practice providing PicoSure laser tattoo removal in Mansfield and Arlington. We have a special 532nm hand-piece that specifically targets colors. Our PicoSure laser has the ability to remove tattoos of all colors, including red, yellow, orange, and green. Do you need a Millennial Makeover? Tattoo regret is experienced by millennials and older age groups – due to changes in employment, desire for military enrollment, changes in relationship status, or overall personal growth. According to statistics, the “typical” American tattoo patient is single, female, 24-39 years old, and college educated and of those, 40% cited employment concerns as the reason for tattoo removal. Most millennials desire tattoo removal. Therefore, if you have unwanted tattoos and would like to have them removed then PicoSure laser tattoo removal can help you achieve your goals! Compared to other laser tattoo devices over the past several years, PicoSure provides safer and more effective technology to remove tattoos faster and with ease. The PicoSure laser not only removes tattoos but our Medical Spa Aestheticians use it for skin rejuvenation using special lenses designed specifically to refract the energy pulses, called PicoSure Focus. Using the same picosecond technology, the PicoSure Focus Skin treatment can treat resistant melasma, hyperpigmentation, and sun damage in dark-skinned patients and Asian patients without skin complications. Furthermore, there is very little downtime following the PicoSure Focus Skin treatment. For more information, contact our office to speak with one of our Medical Aestheticians. How PicoSure differs from other Q-switched laser tattoo removal devices is based on the technology of the “picosecond”. Using patented picosecond technology, the PicoSure laser delivers an ultra-short burst of energy directly to the tattoo pigment in a trillionth of a second. The ultra-short pulse of energy that is directed to the pigment is so fast and quick, it vibrates and shatters the target ink into extremely small particles that are easily and naturally eliminated by the body. The PicoSure technology is so amazingly fast, that is utilizes photomechanical pressure waves instead of photothermal heat waves, thus reducing side effects and imparting less heat injury to the surrounding skin. Other advantages of the PicoSure laser for tattoo removal include fewer treatments than traditional Q-switched lasers and improved removal of all colors. How many PicoSure laser tattoo treatments will I require? The number of PicoSure laser treatments needed for tattoo removal is dependent on ink type, size of the tattoo, and age of tattoo. While other Q-switched lasers can require up to 15 or more treatments, PicoSure can produce faster results with significantly less treatment sessions. With PicoSure, the average amount of treatment sessions are between 3 to 5. During your consultation, our practitioner will evaluate your tattoo and recommend a realistic treatment regime to help you achieve the best and realistic results. How long do I have to wait between treatment laser tattoo sessions? Typically, you will wait 4-6 weeks between treatment sessions, as this time interval allows the body to absorb tattoo ink particles and allows the surrounding skin to completely heal. Current studies indicate that there needs to be appropriate waiting periods between tattoo removal sessions to allow enough ink particles to be self eliminated by the body. This will also be discussed during your consultation as results will vary between all clients. Can I have only a portion of my tattoo removed or a specific color removed? Yes and Yes. The PicoSure laser is precise enough to partially remove specific areas of your tattoo, thus allowing some clients to “repair” or fix preexisting tattoos without complete removal. In addition, our office provides both the 755 nm and the 532 nm laser hand pieces, thus we are capable of removing most all tattoo colors in the light spectrum — black, blue, green, red, orange, yellow. Does PicoSure laser tattoo removal hurt? This procedure is slightly more uncomfortable than getting your original tattoo; however, the treatment session is very fast. In fact, many treatments may take less than a minute. Your practitioner will work with you on the best pain management option based on your individual situation. Our office uses topical numbing medicine and Zimmer Chiller ultra-cool air blower. Will I blister and scab? Blisters and scabs are a normal response to tattoo removal but scarring is extremely rare given the precise technology of the PicoSure technology. Remember, the PicoSure laser was specifically designed to remove tattoos and is far superior than other Q-switched tattoo lasers on the market. Our office will provide detailed post tattoo removal instructions following your session. 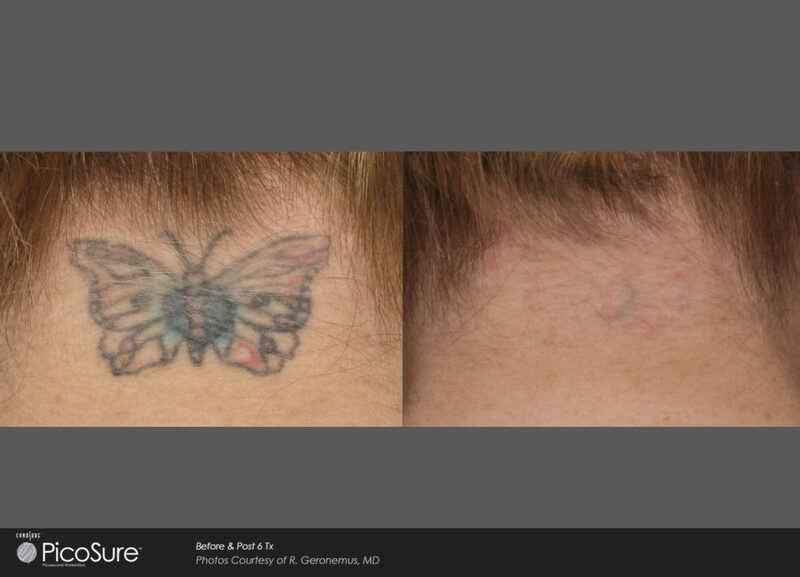 What is the cost of PicoSure tattoo removal? The cost of laser tattoo removal depends on several factors, including the size of tattoo and the number of treatments required for removal. After your consultation, the practitioner will provide you an estimated price quote for the treatment series. Because the PicoSure laser technology is faster, better, and different than other Q-switched lasers, the cost per session is a slightly higher in comparison. However, in the end you will pay less because you will undergo fewer treatment sessions. Our office charges $250 per individual treatment session to remove a tattoo about the size of a business card and we use this sizing as standard for measurement of larger tattoos. Prices may increase up to $500 / session for medium and up to $750 / session for large tattoo removal. **If your tattoo was partially or unsuccessfully treated following the closure of Dr. Tattoff in Dallas, our office will work with you to complete your PicoSure laser tattoo removal sessions. Please contact us for further details.